Well, if you’re building this engine then I hope the valve gear goes more smoothly for you than me! I cannot believe just how long it has taken to complete the reversing gear on the engine – and it’s still not done. 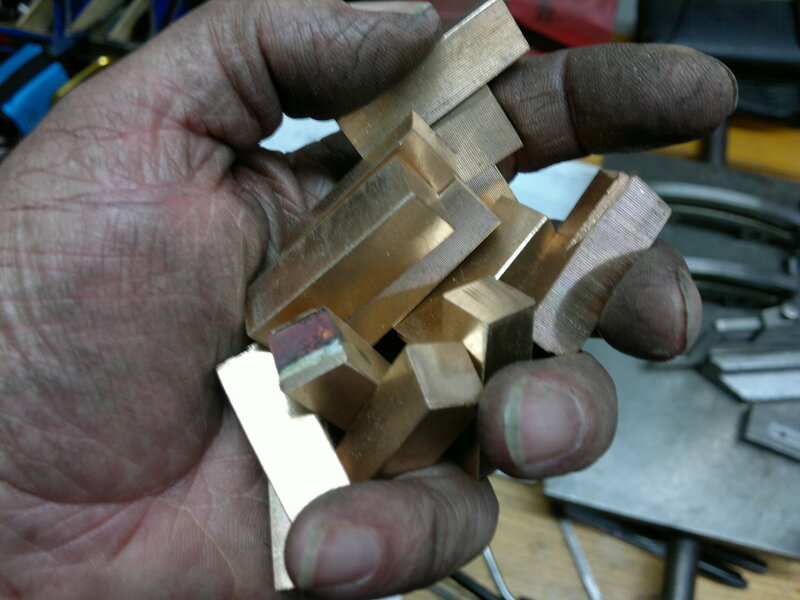 The multitude of little blocks (drag-link bearings) take an age to make – if you had some 7/16″ sq Ph Bronze bar to hand then it might be OK, but I didn’t so decided to hack the blanks out of a piece of 2-inch square bar I had. However, I discovered that my trusty Warco bandsaw did not cut as straight as I hoped, and half of the resulting blocks were undersize. So then you spend a while silver soldering extra bits back on, to bring them to size, and then (literally) DAYS on the shaper, transforming a set of rough cut rhomboids into little cuboid shapes. 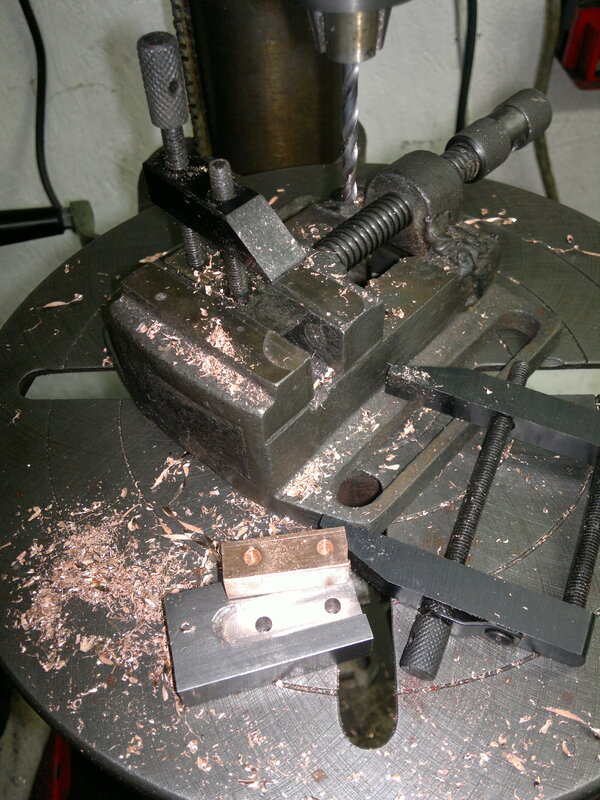 Meanwhile a relatively simple turning and pressing job produces the pins for the lifting arms and eccentric pivots. Drag Link bearing pins pressed into lifting arms and allen-screwed into expansion links. I happened to have some EN1A on the shelf that these got cut from – this is lovely free-cutting (leaded) mild steel, but I must confess I worry that this is so “soft” that it might not last well in service. BTW – Midway thru the gear building I ran short of 1/4MS bar. So I went off to Metal Super Markets in Southampton (metalsupermarkets.com) and stocked up on a variety of bar and plate, that my “stores” were running short of; (these really are great people, and very helpful and economic – I would recommend them to anyone, over the counter service with a smile, for even small quantities) – But they only had EN3B, and when it came to turning and screw-cutting this stuff you really miss the free-cutting EN1A!!! The only issue with the manufacture of these pins, is that one of the errors in the drawings means these pins need to be longer than drawn, to clear the bolts and lock nuts securing the Expansion Links and Die Blocks. There’s not a lot of space, so take care – I extended mine to 1.5″ overall (I think). 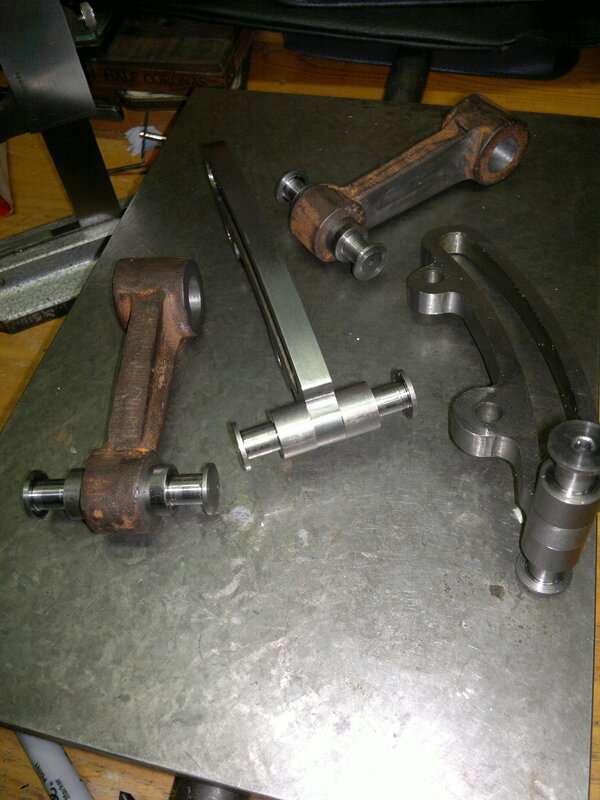 The next job was to drill the bearing halves for the rods. I did this by clamping them into a small jig (with tool-makers clamps). My normal approach to this would be to soft solder (“sweat”) the bearing halves together and then drill and bore them as one, separating them at the end. 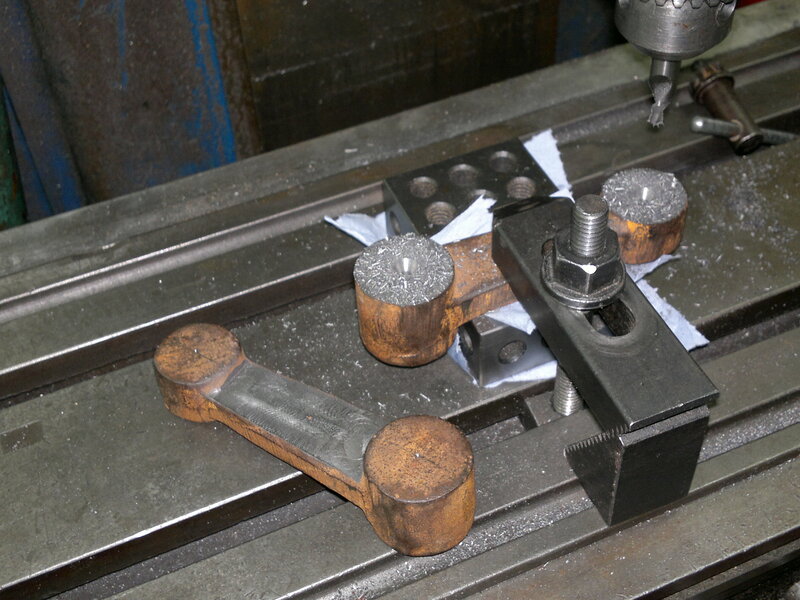 But this was not what the ME articles said – so I followed them… The plan was to create a small jig, drill half the blocks 2BA clearance and the other half 2BA tapping – then tap these and use temporary screws to assemble them into pairs while they are bored, and then open out both sides to clearance for the long rods to be fitted. I think this approach was slower. A better plan would have been to solder them into pairs while they were all still oversize, drill, bore, finish to size and then separate. As it was I then discovered that despite machining all the blocks to size, the journals on the pins were too tight (only a few thou, but enough to stop them fitting, so yet more fettling was needed)- At this point I discovered that the relevant reamer has gone missing, so more careful hand work on pins and bores (scrapers and emery tape) was needed to get a good fit…. This is about to start sounding like the blog of a complete idiot, but at least it’s improving my patience. Firstly, while assembling and testing the valve gear (prior to first run on air) I found that the LP valve was fouling something and could not accommodate the full travel of the eccentrics, over a couple of hours of assembly, disassembly, reassembly (repeat as needed) I came to the conclusion that the tailrod was too long and clouting the end of the tailrod guide… there being no opportunity to lengthen the guide, I decided to shorten the tail rod – carefully sawed 1/4″ off, and reassembled again, only to find it STILL DOES NOT FIT!!!!! The HP valve rod has a “joggle” on the bottom to line up the valve rod with the eccentrics. I decided to make this as a separate part and screw it to the rod proper. This joggle also serves to further widen the already widened drag-link pins resulting from the error in the drawings. I did measure this and allow for it in the longer pins – but I forgot to take account of the lock-nut on the die-block pin….AAAARRRGGG!!! Either way it provided me the opportunity to screw-cut the 3″ long 3/8″x26 thread on the new rod, using the off-set compound slide method often recommended (but never tried by me) mechanism – and it does a much nicer job (even on the nasty EN3B! ), so I conosoled myself that the extra 3 hours work, had resulted in a nicer job (displays a fixed grin)! BTW, In this process I again reminded myself that under conditions where you need to take fine cuts on tough material a carefully sharpened carbide or carbon steel tool will outperform a indexable tipped tool – as if you check the specs these are not typically made to make a cut of less than 5thou ! Overall these 16 half bearings and eight rods and 4 pins took more than a 10 days of effort (probably about 30 hours! not including the remaking of the vale rod) – a slog…. assembling the whole sh-bang produced something that worked but was too stiff, so more fettling and adjusting needed! I am really hoping I can bring this all to a good end – sometimes I wonder! 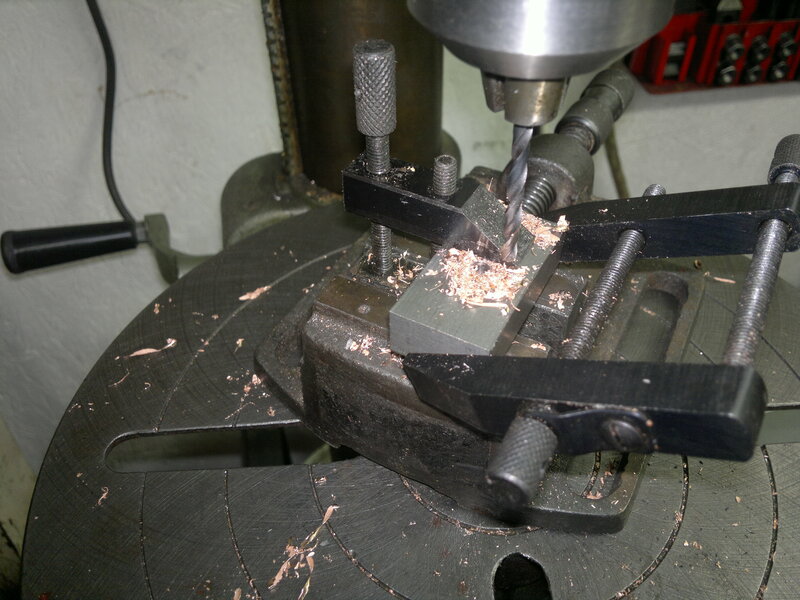 This entry was posted in The Power Plant and tagged drawing errors, lathe work, leak compound steam, marine steam engine, scraping, shaper, valve gear on February 11, 2014 by sybefur.